compliant. Workers in the gas, oil, petrochemical and utility industries and anyone at risk of exposure to electric arc and flash fires need FR clothing. 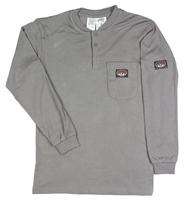 Rasco FR Henley T-Shirts come in a variety of colors. Need help with choosing your shirt size? Refer to the Rasco FR Shirt Sizing Chart.